This Request for Information (RFI) was openly posted on the website of the Minnesota State Fire Chiefs Association. 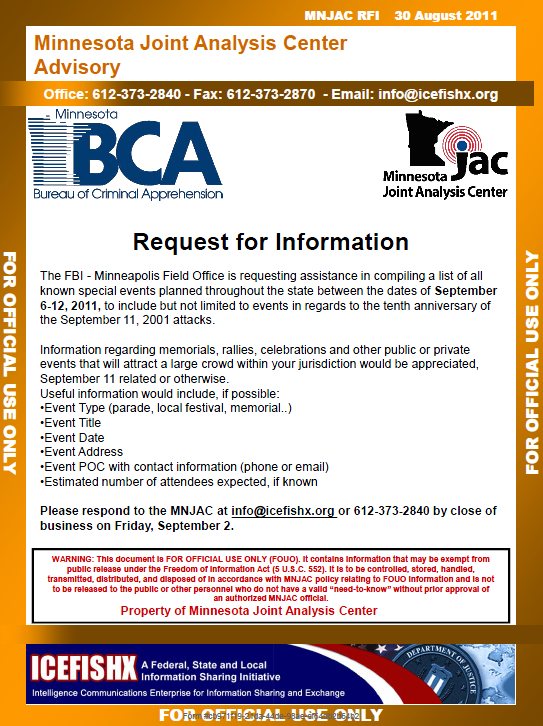 The FBI – Minneapolis Field Office is requesting assistance in compiling a list of all known special events planned throughout the state between the dates of September 6-12, 2011, to include but not limited to events in regards to the tenth anniversary of the September 11, 2001 attacks. Information regarding memorials, rallies, celebrations and other public or private events that will attract a large crowd within your jurisdiction would be appreciated, September 11 related or otherwise.